Tonight’s the night all Metsdom has been waiting for: the Major League debut of top prospect, pitcher Noah Syndergaard. He arrives on the Major League stage at Wrigley Field accompanied by much fanfare and already in possession of a nickname: “Thor”. The genesis of the nickname was Syndergaard’s Halloween costume this past October, a photo of which he tweeted and which was then retweeted widely. Naturally, the blogosphere is having great fun with the nickname and its associations with the Marvel Comics superhero and subsequent movie of the same name as well as the character’s original incarnation in Nordic mythology as the God of Thunder. 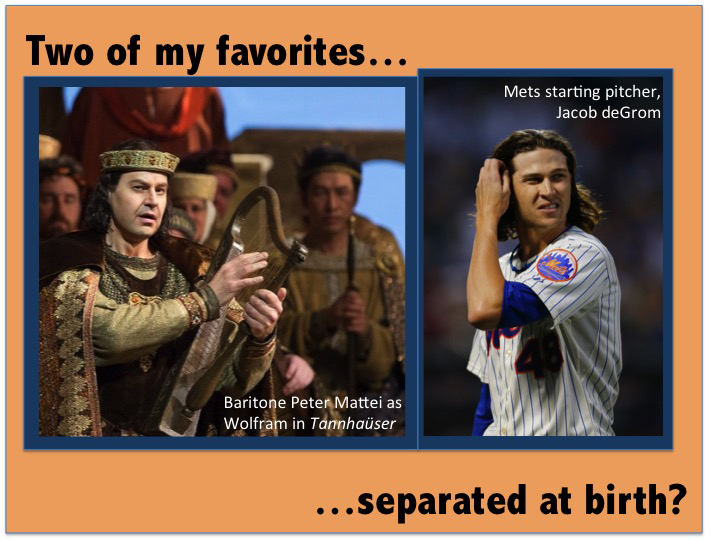 However, as an opera lover, “Thor”, conjures up something different to me. At the mention of “Thor”, I hear softly murmuring arpeggios in the cellos. Then, I hear the Violas joining in. Then the Second Violins. And, finally, the First Violins. The undulating sextuplets I hear in my mind are the magical introduction to Thor and his sorcery as written by Wagner in his opera Das Rheingold. First, I should mention Wagner’s god has a slightly different name: Donner. The Old German equivalent of the Norse “Thor” is “Donar”. Donar’s name day, as it were, became Donnerstag “Donar’s day”, otherwise known to us English-language speakers as “Thursday”. 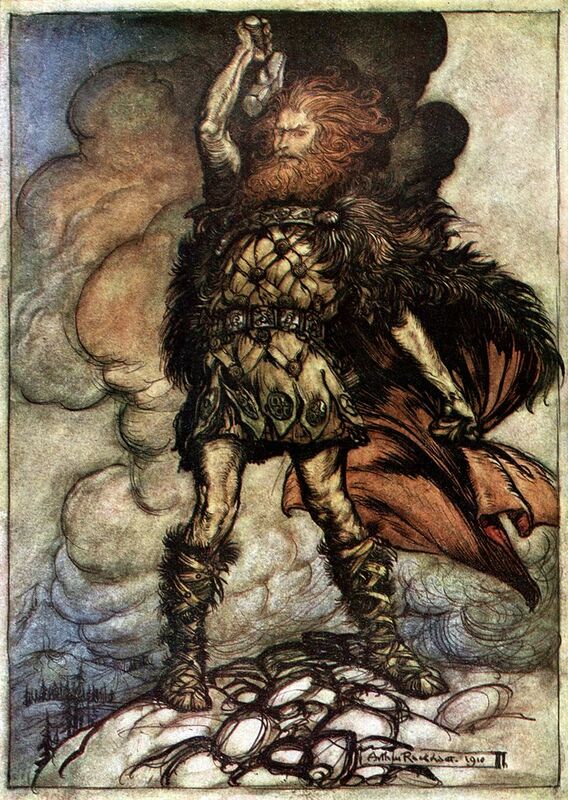 Arthur Rackham’s depiction of Donner. German composer Richard Wagner spent years composing a Ring Cycle comprised of four operas, based upon Donner and other gods of Norse mythology. The first opera, Das Rheingold, is performed as one act–with no intermissions. The four scenes of the opera meld seamlessly into one another, and there is no break in the music or drama from the beginning until the end, about two hours and forty minutes later. Towards the very end of the opera, there is an exhilarating moment for Donner, a role for bass-baritone. After all of the mayhem and madness following a goddess coming up out of the ground unannounced and a bloody fratricide, Donner decides that it is time to, literally, clear the air. The god of thunder and storms conjures up a thunderstorm meant to dispel the fog and general discontent. Donner’s glorious invocation to the heavens, summoning the cleansing mists, is stirringly answered by four French horns, playing in unison. The ensuing winds and storm rage as the string arpeggios morph into an ascending scale, by the whole orchestra, gradually increasing in intensity and dynamic until, [ding], Donner wields his hammer to dispel the storm and, how operatic, a rainbow then magically appears. *Eberhard Wächter with the Vienna Philharmonic, conducted by Georg Solti. It’s a magical moment in music. 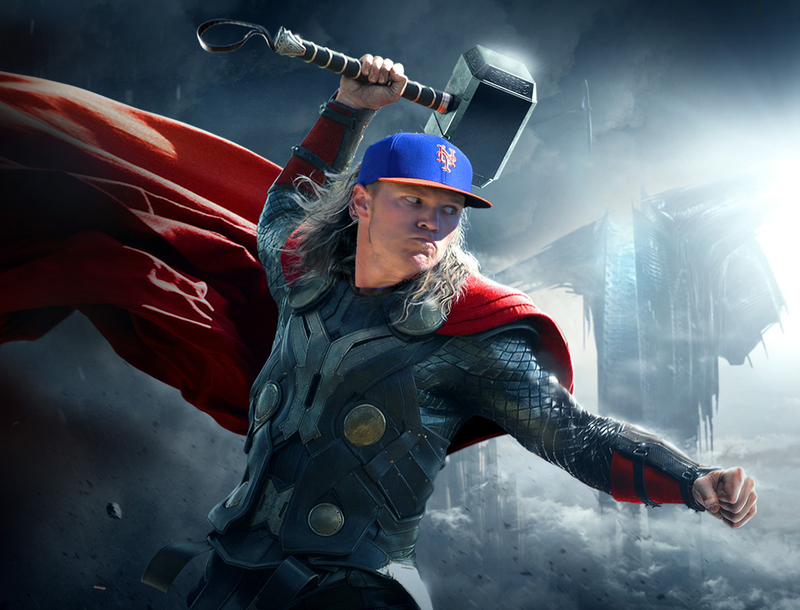 I don’t know what kind of magic Mr. Syndergaard might wield on the mound this evening or in his starts to come. But this optimistic Mets fan can’t help but hope for signs of a dominating talent. Let’s face it: as a Mets fan in 2013, it’s slim pickings when it comes to finding something to get all hot and bothered about. Sure, watching Matt Harvey pitch is a delight. But through no fault of his own, it’s been a long time since he’s recorded a win. Yes, the Subway Series was a very welcome and wholly unexpected surprise. It felt awfully nice to put on some Mets gear and walk around with a certain amount of swagger in one’s step, am I right? Was anyone surprised that the Mets’ euphoria coming off the sweep of the Yankees in both stadiums was not enough to get even a single, stinkin’ win in Miami? I, for one, was not. But here I am–frustrated, angry, and bored with my team–typing away excitedly on a blog post after having remained basically mute for a good long while. It’s not my team, however, that has propelled me to the keyboard, but it is something familiar to baseball fans: the practice of singing “God Bless America” during the seventh-inning stretch. The fact that this post-9/11 addition to “Take Me Out to the Ballgame” has remained a staple well beyond 2011–at every Yankee home game and at many stadiums on Sundays–has bothered me. Come to find out, it bothers others too. It bothered a Methodist pastor in the Washington, DC area so much that he wrote a letter that appeared in the Washington Post recently. What followed were over 3,000 comments online, including my own, and a virtual dialogue on a subject that, lo and behold, has a lot of other people–including Christians like myself–hot around the collar as well. So, I submit as my return to the Mets blogosphere the following post on a topic which, unlike the Mets’ playing this season, has inspired and excited me and ultimately motivated me to write again. These are my comments, as posted in the online Comments section that appears below the original opinion in its online version. Please do read the original opinion. It is beautifully written and makes some excellent points. By the way, while I might not condone public songs with religious connotations (except in the context of a religious service, of course), far be it from me to discourage any Met fan from saying a prayer–in private–for this team if he or she is so inclined. Heaven knows–pun intended–they need it! My two cents’ on the subject at hand. Please do read the original piece and others’ comments. Click on the link embedded above or click on the screen shot above.